My newest article “How To Tackle Stress In A World With The Highest Stress Ever” was just published on Medium. 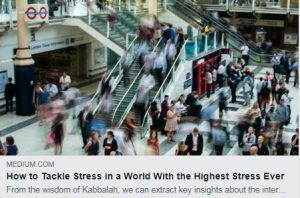 We can extract key insights about the internal mechanism driving the upswing in human stress from the wisdom of Kabbalah. By understanding the process at work, we can become empowered to effectively intervene. Crossing streets jammed with heavy traffic, approaching the workplace every morning to face an avalanche of duties, returning home after a 9-hour work day plus a long commute to tackle parenting, financial, health and relationship problems have become the dead weight of our modern world and the never-ending sources of intensified stress. Polls show that stress levels in the US are at all-time record highs. According to this year’s report of the American Psychological Association, approximately 90% of young Americans of Generation Z, age 15–21, are among the most severely affected. The rest of the world is in no better shape. A study conducted by Gallup in more than 145 countries revealed that people’s reported daily worries, stress, physical pain, sadness and anger have hit the highest levels since the researchers began collecting data. In order to capture trends in despair or hope, the Gallup study calculates a Negative Experience Index, and recent findings reveal that it has risen from 23 to 30, representing a major 30% increase over the past decade. Stress levels, in particular, among Americans are higher than the overall world average, according to the Gallup study of 154,000 people. Surpassed only by Greece, the US population is now more stressed out than any other people in the world. Findings from the 2017 American Psychological Association’s “Stress in America” annual survey indicate that as many as 63% of Americans are stressed about the future of the nation, money, work, the political climate, violence and crime. This frightening phenomenon of escalating stress that we are experiencing today also affects people’s health and well-being. Chronic stress is found to be related to multiple health-related problems: heart disease, diabetes, stroke, and depression, to name only a few. There is, and how brightly the light shines depends on us. From the wisdom of Kabbalah, we can extract key insights about the internal mechanism driving the upswing in human stress, and by understanding the process at work, we can become empowered to effectively intervene. According to the wisdom of Kabbalah, the origin of stress, as well as all the ills and misfortunes that rule our lives, can be traced back to the ego, the part of human nature that constantly pushes us to achieve the unattainable. A person is a desire to receive pleasure, and there is a sensation of calmness and satisfaction if pleasure is received. However, from generation to generation, our desire for pleasure constantly grows, and along with it, the demand for fulfillment which then also multiplies the efforts we need to exert to achieve our goals. This is the process driving the trend for life to become increasingly stressful over the years. Today, we are bombarded by external pressures from the media, from the Internet, from all aspects of the environment that dictate the standards we are expected to meet: travel to fancy or exotic places, achievement of the highest professional success, respect and admiration from our peers. In short, we are spurred at every turn to stand out from the crowd at any cost. With everyone beating their way up the same mountain, we are forced to build our success atop the failures of others. As a result of the constant pressure of this ruthless competition, we live under permanent stress. Living as we do in a society that is completely controlled by egoism, we are unable to escape from this pressure even by closing our eyes or traveling somewhere else. Stress haunts us no matter what we do to escape. Neither antidepressants nor narcotics, so prevalent in today’s society, can erase the emotional pains. Why Is Our World Built Upon an Egoistic Nature that Forces Us to Compete With Each Other? The science of Kabbalah explains that stress serves the purpose of bringing us to awareness of our egoistic nature and its negative consequences that affect us on many levels.Ultimately, we are destined to reach disillusionment and to recognize our situation as hopeless, to understand that we must reassess our values and leave the rat race we are running . Then we will urgently search for a different route and taste a new type of pleasure in a completely different place. In such an environment that values relations of solidarity and mutual understanding over divisions, we will still compete to receive fulfillment, but in a whole new way. The one who brings the biggest benefit to others will be considered most successful. Pleasure from bestowal to others is much more intense than any egoistic fulfillment and it does not lead to stress. In fact, the more we give, the more we all enjoy. Such a state will prolong our lives and make them better, more comfortable, safer, and more pleasant. An environment of altruism will complement and balance our lives. When this happens, we will also begin to thrive inside the integral connection between us and nature, that which has created all four forms of existence — still, vegetative, animate and human — and sustains them in perfect balance. We will step into a whole new world and feel the next level of our qualitative evolution where we will be able to control our lives. When Will All People Feel A Spiritual Awakening?